We are proud to announce that we were approved as vendors at the Rockford City Market in Rockford, Illinois. This means that we will be displaying and selling many of our products every Friday beginning on May 22, 2015. Customers can actually see and handle our products and even place orders to be picked up the following Friday. We are super excited about this opportunity and look forward to meeting many of our loyal customers in person! For more info about the market, including hours, location etc. just go to www.rockfordcitymarket.com . We hope to see you there! 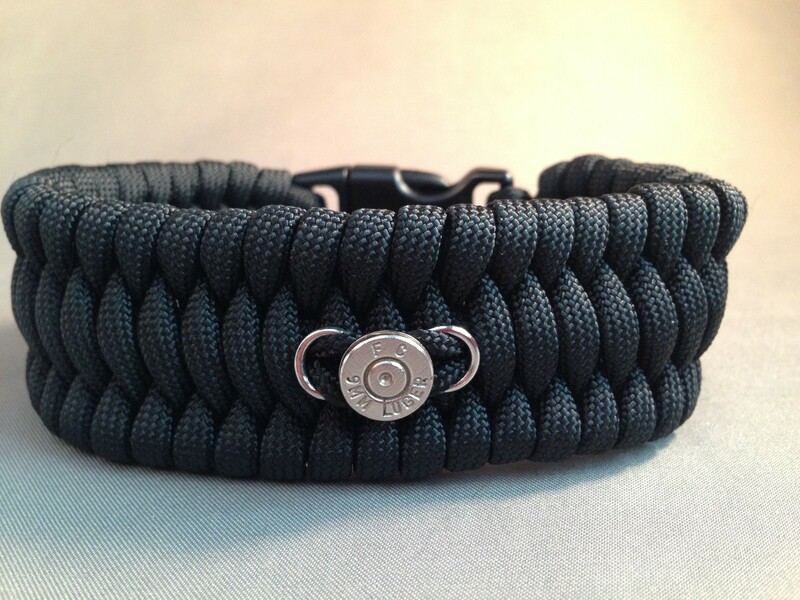 Lately, we have been concentrating on expanding our paracord/ammo line. We really like the rugged look and practical emergency uses of the paracord combined with our cool ammunition components. We think our products fill a unique niche in the marketplace. Today’s new listing features a bracelet that we weave to your desired length, using your desired paracord color and your desired caliber case head. Pictured here, you can see our 9 mm Case Head Trilobite Bracelet. We really like the understated and subtle look of the bracelet and hope you do too!